I know you’ve seen what blogging can do for your business… That’s why you are on this page. But it’s one of those things that’s easy to push to the side. Especially when you’ve got 101 competing priorities – client deadlines, the accounts, writing that book you’ve been meaning to, your family, the dog, your health. Blogging can always wait can’t it? I was so gung-ho about running a business I forgot about everything that had got me to where I was. All my energy was going into the client side of things, and my blog was slowly becoming a ghost town. It got to the stage where I would post an article, and expect an immediate up-tick in shares and comments. When I didn’t get it, I would feel deflated. Because I was wearing so many hats in the business, the things I KNEW would get me results with blogging were getting pushed to the side. Promoting, networking, nurturing – everything became secondary, and it was to the detriment of my greater business goals. The day I decided to start outsourcing blog tasks was like a giant relief, a weight off my shoulders. I didn’t have to be everything to everyone anymore, and could focus on the game changers instead. Quite ironically, it’s the whole reason my business even operates – people want results, but they’d prefer to pay someone else to do the grunt work. If you want to earn back your time and SCALE up your content efforts, you’ll love what’s about to come in this post. I’ve created an infographic with 27 time-sucking blog tasks you can choose to outsource (Many of which we do for clients here at Blogger Sidekick). Below the infographic you’ll find my take on each of the main sections, including some additional tools and tips. In the end, outsourcing blog tasks is really about saving you time, so some of the tools and tips I share are about managing your outsourcing projects and getting more out of your efforts – not just where you can outsource tasks. All of the tasks in this infographic can be outsourced in isolation, which means you can start outsourcing things regardless of the size of your business. The sooner you do, the quicker you will grow. Alternatively if you’ve got a bit of money to spend you could outsource these tasks to a blog or content manager. A couple of special thanks to Adam Connell and Jason Quey who were kind enough to contribute expert quotes based on their experience with outsourcing blog tasks. Also, a shout out needs to go to Piktochart – we created this image from one of their easy-to-use templates! Feel free to embed the graphic on your own site, there is a pre-crafted embed code to make it easy for you. The strategy section is an interesting one, because I strongly believe you can’t “outsource your strategy”. Your content strategy needs to be aligned with your business goals, and for it to get the traction it needs to, should come from internal employees and the key drivers of its success. However, you can outsource certain time-sucking components of it. And you can certainly lean on experts to get your strategy going in the right direction. Have a think about how you can set up fool proof systems for some of these strategy components and enable others to fill the space. In terms of blog post ideas, you can run a research project on UpWork or Freelancer, and put together an in-depth brief on how and where you find ideas. Once you have the brief you can replicate this time and time again. Chasing up internal contributors can be a full-time job in itself, so put the deadline in someone else’s capable hands. Outsourced blog managers can set mini-deadlines, communicate with your employees about blog topics and setup pre-deadline phone calls to make sure your content schedule stays on track. Don’t forget, you don’t HAVE to be an expert at content if it’s not your thing. Find someone who is and get them to build a preliminary strategy for you. It’s the first thing we do with just about all of our clients. This guide on successful business blogging will also help. If you are planning on outsourcing idea generation, HubSpot’s blog topic generator tool could be something you ask your assistant or freelancer to use. It’s in no way a replacement for a savvy marketer, but it certainly saves a lot of time and energy and can get the creative juices flowing. UpWork is an online marketplace for discovering high quality freelancers for just about any task you need done. It also offers the piece of mind of a built-in payment and review system – this is a great place to start if you’re new at blog outsourcing. If you are looking for someone to manage and motivate internal blog contributors, ScheduleOnce is an awesome online meeting tool for when you need to pre-schedule chats or follow ups. It integrates easily with most calendar applications such as Gmail or Outlook, and offers a unique scheduling page for each user. When developing your content strategy, coming up with blog post ideas and liaising with multiple contributors – it is helpful to have an online hub to share ideas and content. Trello offers a visual pin board that multiple users can collaborate within, some teams even use it as their content calendar. As well as sharing ideas, often you will need to communicate with freelancers or internal staff without getting lost in their inbox. Slack is perfect for this. Just as it claims, it is a messaging app for teams that acts as almost an internal Twitter stream. If you need real-time communication, Slack will give it to you in an easily understood format. Manifest.ly is like an online to-do list tool, and it’s a great accompaniment to running an effective freelance or outsourcing project. You can create templates or checklists, share them with team members and track as each section of a task is completed. CoSchedule is one of my favorite blogging tools because its benefits go beyond its core function. Yes it’s an editorial calendar that integrates with WordPress, but it’s also great for managing social media messages, collaborating with team members and making sure blog deadlines are met. A tool like this will help you get better results with blog outsourcing tasks. Research tasks don’t require as much intuition and strategic thought, so they are perfect for saving you time and outsourcing the grunt work. You can hire an SEO expert to conduct in-depth keyword research for you, or if you know your stuff just get a VA (virtual assistant) or freelancer to help out. If you’re going to get a “non-expert” to do this research, they will most likely need a fair bit of specific training. I’ve found screencasts work best. Expert round-up posts are a great way to get lots of attention to your blog and connect with some industry influencers. Whilst I think it’s important for the outreach emails to come from you, hiring a freelancer or VA to find the details of your potential contributors is a great time saver. An alternative is to hire Codrut Turcanu from BestExpertRoundups.com who does large scale round-ups for a fee. Competitor analysis can help you find content opportunities and what is proven to perform well with your audience. Again, seeing a lot of what you will do for this is tedious and repeatable – pay someone else to do it, and teach them how you would like it done. When it comes to outsourcing research tasks (or any task for that matter), the more guidance you can give, the better your results will be. That’s why Snagit is such a must-have tool for me. Snagit not only lets you take screencasts, but you can also use the tool to take screen stills and then annotate them with text and other helpful information. If you want to outsource a task, create a step-by-step process paired with a voiceover and then turn it into a screencast using Snagit. I’ve found Google AdWords alternatives such as KeywordTool.io are a little easier to explain to outsourced workers who may not be SEO experts. The more complicated a tool is, the harder it will be for you to teach someone to use it. If you regularly read my blog, you’ll know that I love BuzzSumo. The reason it is popping up again in this outsourcing article is because it’s such a massive time-saver. If you plan on outsourcing blog-related research tasks such as finding proven topics or previous social sharers, BuzzSumo brings all that information into one place. Much like BuzzSumo, SEMrush is in here because it’s a time-saver. If you want to find out information about your competitors and the keywords they are getting traffic for, SEMrush is the place to go. The cool thing about outsourcing blog tasks to expert freelancers is that most of them have subscriptions to the tools they need to get the job done, saving you even more money on a bunch of subscription services you don’t really need. Content creation requires different levels of skill and experience to execute. My tip is to find all the low skill activities and outsource them. Save yourself for the final 15-20% of content creation; that’s where the real value is added. You could create an audio file and get it transcribed into a blog post. Get a consistent and repeatable look for images on your blog and hire someone else to create them for you using a tool like Canva or Piktochart. If you accept guest blog contributions, get a blog manager or managing editor to find, coordinate and filter potential contributors. Uploading blog posts can be a very time-consuming part of blogging, especially the image part. Services like WPCurve and Automation Agency are great for repetitive tasks like this if you use WordPress. Otherwise bring on a blog manager or VA with some web skills. Improving the quality of your content can be done with a few small tweaks by another set of eyes. If you have an editor they will play this role, but if not you can use proofreading tools like Grammarly. Hire an expert blog writer who has experience and a proven track record for writing great content. ProBlogger’s job board is great for discovering good writers, so is Express Writers Julia McCoy’s business, otherwise some excellent choices in the online marketing space are Ariel Rule, Bamidele Onibalusi and Kristi Hines. If you have any audio or video files that you need to get transcribed, Speechpad is going to become your best friend. For every minute of transcription it only costs $1.00 and is human-generated! I’ve used this on a few occasions with clients and the quality is pretty decent. Gone are the days where you need to hire a graphic designer to create unique blog images. Tools like Canva have made it really easy to replicate a look and feel with templates and a library of image add-ons. By creating a set of consistent images in your Canva library, you can then get someone else to create them for you – they don’t even need to have a design background! Much like Canva, Piktochart makes it really easy to create unique images – infographics more specifically. (The one in this post was made using their platform) So instead of paying big money for graphic designers to make your next infographic, pick a template and hire an assistant to research some statistics for you. 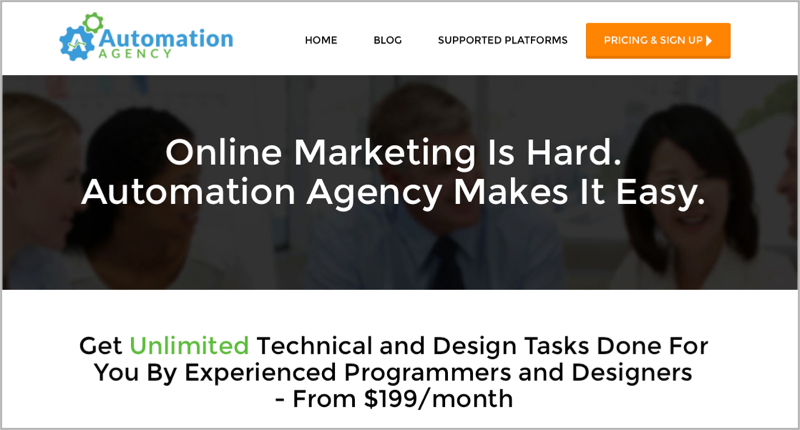 For any ongoing marketing tasks – design, landing pages, email copy, uploading blog posts – you can get Automation Agency to handle it all for a reasonable monthly fee. They have put together a team that usually get tasks done within 10-12 hours of lodgement. Sometimes you will just need someone to write content for you – an expert. ProBlogger’s job board is a great place to find them. Grammarly is a cool tool for editing and improving your blog writing. It’s kind of like having an editorial team member without all the fuss! Promotion is an essential component to running a successful blog. But you don’t need to burden the time intensive parts of it yourself. Use screencasts and step-by-step processes to help others do the promotion for you. Running outreach campaigns on social media or email is very time-consuming, but with the help of tools like ContentMarketer.io, BuzzStream, YesWare and Buffer it’s much easier to systemize and get someone else to help with. Ongoing social media management and re-promoting evergreen content is a core ingredient for getting your site found, tools like Meet Edgar and Social Oomph have made it extremely “auto-matable“. You can outsource the less frequent tasks of adding social media content into these platforms and keeping on track with your audience engagement. Your email list drives perhaps the most controllable traffic to your blog and website, which means creating regular broadcast emails for your blog posts is essential. If you can create an “email broadcast formula” or template, it becomes much easier to have someone else prepare it every time. Alternatively if you’re looking for an expert to take your email copy to the next level, Will Hoekenga from Copygrad knows his stuff. Re-purposing blog posts into different formats will give you exposure to a bigger audience. SlideShares, Infographics, Videos and Podcasts are just some of the mediums you could be leveraging. When it comes to re-purposing content, you can look into running a contest on Fiverr. I’ve had mixed quality from the platform, but for the price it’s worth a try. ContentMarketer.io helps you promote your blog content by connecting with influencers on social media and over email, all from one nice looking platform. Sujan Patel is the mastermind behind the software and his content marketing results speak for themselves. Once you get in and familiar with how this software works, it would be super-easy to get an assistant to do most of the leg work. YesWare is a Gmail plugin that enables you to send large scale outreach campaigns, track opens and clicks, as well as schedule automated follow-ups. Whilst you may not get an assistant to click send on your personal emails, they can conduct influencer research and load a spreadsheet into YesWare. Then all you will need to do is click a button. 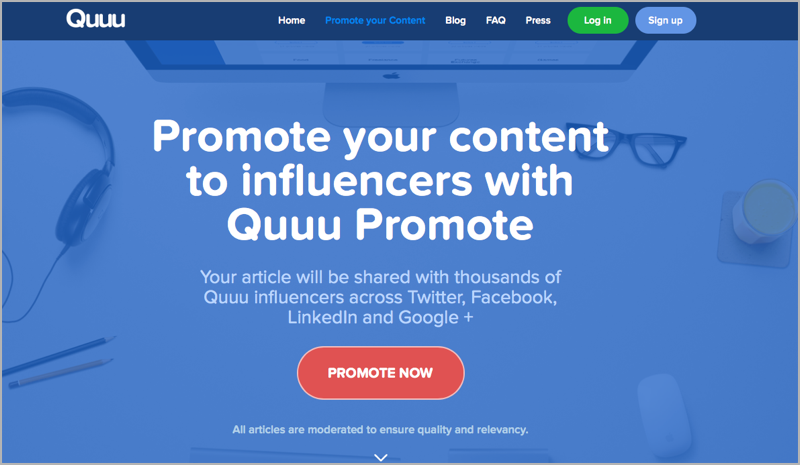 Quuu is a new platform that automates hand curated content suggestions for your social media platforms… But that’s not why it’s found a spot in this blog outsourcing article. You can also pay a one-off fee to get your blog articles shared on auto-pilot by the growing community for a month. I’m yet to track the ROI fully with this one, but with all the effort we put into content promotion it feels like a great solution. Ahhhh Meet Edgar… Perhaps my favorite software in my marketing toolkit. I remember when I first signed up for Meet Edgar, I was about to hire a VA to do exactly what this software does. Essentially it stores a library full of social media messages that you can send out on a recurring schedule – perfect for evergreen content. Much like Edgar, Social Oomph automates your social media sharing by storing a list of updates. Both solutions have their quirks, but I choose Edgar for its visual look and feel and ease of use. Social Oomph is a little more old school. Fiverr is similar to UpWork in the sense that it offers an online marketplace for posting tasks and having freelancers do work for you. The idea being that you can get tasks done for five dollars. Of course there are certain things that need more investment. In my brief experience with using Fiverr I have had mixed results, but for the price you may like to check it out. If you’re serious about scaling your business you shouldn’t be doing any of the tasks outlined in this section of the infographic. All of them are easily outsourced to people with less expertise than yourself. Link prospecting is all about finding potential people who can backlink to your content. It’s a research task to optimise your site for search engines. If you don’t fancy yourself as an SEO strategist, you can find experienced freelancers on UpWork and other marketplaces. Alternatively, if you know your link prospecting process really well, it’s possible to teach a generalist VA how to find the things you need. Updating your internal links should be a regular endeavour – making sure you don’t have broken links, linking new blog posts to relevant anchor content and boosting your SEO strategy as a whole. A service like WPCurve will be able to do some of these small WordPress tasks for you, otherwise you may consider hiring a VA with some basic tech skills. On-page SEO really feeds on from the last point, but there is more to optimizing your site than just internal linking. You can download our SEO Content Bundle and checkout the “Anchor Search Checklist“, a visual representation of all of the important on-page SEO elements. Also if you use WordPress, a tool like Yoast SEO is great for keeping on track with this stuff. Link outreach is a big part of improving your SEO results and optimizing your site. As I said before tools like ContentMarketer.io, BuzzStream and YesWare make it much easier to systemize the process and get someone to help do the heavy lifting. The final task in this section is image optimization. On top of including descriptive and keyword-rich alt tags with your images, they should be an optimal size so that your page loads quickly. WP Smush.it is a helpful tool for reducing the size of images, but you can also seek help from services such as WPCurve and Automation Agency if the tech side of things isn’t your sweet spot. Much like Automation Agency, WPCurve is a service that offers unlimited tasks for a monthly fee. But it is solely focussed on WordPress tasks. I personally use the service because it removes the WordPress headaches and provides piece of mind! It’s a great alternative (and much more affordable) than hiring a developer. Yoast SEO is a WordPress plugin that integrates with all your blog posts and pages to help you optimize them for search engines. Not only does it provide guidance along the way but it will help you better understand what is important, especially if SEO is something you’d prefer not to worry about but know it is important. BuzzStream is designed specifically for email outreach campaigns, and it’s great at doing it. You can develop templates, add in contacts, integrate it with your mail service provider and conduct big outreach campaigns with a few clicks. In terms of saving you time, not only does it streamline the process, but it offers a platform where your researchers can add contact information – much more reliable than a spreadsheet. WP Smush.it serves a simple purpose – reducing image sizes, improving the speed of your website and hence boosting your SEO efforts. It’s a huge time-saver and well worth checking out. Conversion and design skills are a little more pricey and specialized than some of the other tasks mentioned. So it only makes sense to hire people to do this once you already attract a steady flow of traffic to your site. A/B split testing is all about finding the best possible method for delivering an offer or a lead magnet. Over time it will help you get better conversion rates and grow your email list more quickly. LeadPages has a built-in split testing tool for its landing pages and LeadBoxes, but if you want to take it up a notch and hire an expert – consider hiring Devesh Khanal. Creating lead magnets and content upgrades can be quite time consuming, which means outsourcing it is a great idea – especially if you’re not design-focused. If you do plan on outsourcing this type of task it’s important to maintain brand consistency by using replicable templates and style guidelines. If you want a bootstrap solution, you can download our content upgrade template set instead. Squeeze page creation is something you will need to do again and again, especially if you’re running ad campaigns or guest blogging to grow your email list. LeadPages makes it super-easy with their in-depth template library, and if you want to personalize your pages you can outsource the task to a service like Template Launcher. LeadPages offers a broad suite of landing page templates, popup boxes (LeadBoxes) and split testing for anyone trying to grow their email list. If you plan on outsourcing tasks, there are a lot of freelancers out there that understand the LeadPages platform. Automation Agency also do LeadPages tasks. If you want to scale your content efforts and rapidly grow your business – blog outsourcing is something you need to seriously consider. But in the end it’s all about saving you time and helping you focus on the things you are GOOD at, the game changers in your business. So don’t outsource for the sake of it. Automate and eliminate as much as possible first by using the tips, tools and tactics I’ve suggested in this article. Then once you are ready, dip your toe into the outsourcing game with a few Fiverr and UpWork projects. The more you do it, the better results you will get and the better you will feel about everything. Over time you can turn those little projects into bigger projects and eventually ongoing outsourced relationships. You don’t have to go it alone and constantly feel run off your feet. Help is available, and it’s more affordable than ever. The growth of your business depends on you making this choice.